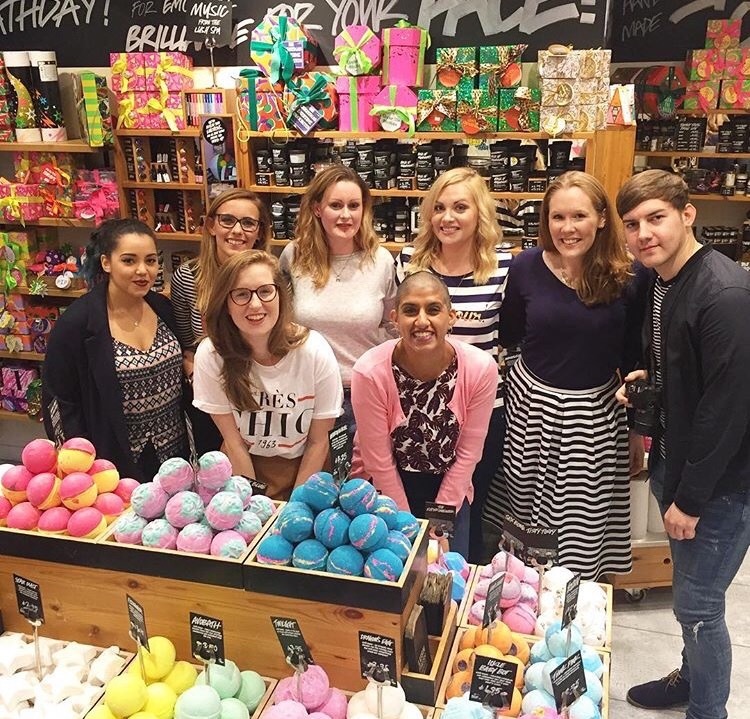 After being in love with Lush for so long now, I was absolutely ecstatic to be invited to their Christmas Bloggers Party last weekend! Dreams really do come true. Okay okay, I hear you, it's not Christmas for another 2 months but who cares? It's never too early! Plus, if Lush are showcasing their new Christmas range, why would you not want to be there? The event was held at Lush Crawley, which I'm not gonna lie, it took me a while to find as Google maps took deep joy in getting me lost! When I arrived, I saw Katie from Katie Kirk Loves and Holly from Closing Winter and also met some lovely new faces too! It was nice to have a quick catch up and a bit of a chinwag with them before getting stuck into the evening. It didn't take long to get stuck in to the food and learn about all the new products. We also got so many demos from the Autumn and Christmas range! Here are the Northern Lights Bath Bomb and Autumn Leaf Bath Bomb in action. Aren't they so pretty? During the course of the evening, we got a Lush cocktail masterclass from Matt, who knew exactly what worked with what. 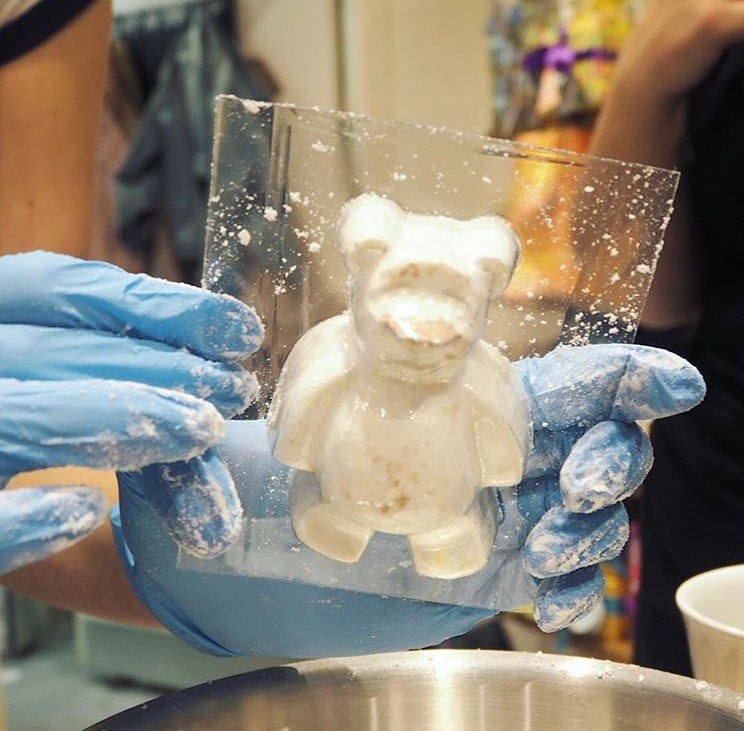 He mixed Milky Bath Bubble Bar with Peeping Santa Bubble Bar which smelt amazing. Normally, I'm not the biggest fan of the Peeping Santa scent, however Milky Bath made it smell so much nicer - so I'm definitely going to try my hand at that Lush Cocktail sometime! He proved that there is literally no limit to what you throw into a Lush Cocktail! This has definitely inspired me to be more creative with what I throw into the tub! I spent A LOT of time wandering around the store, smelling and hunting out all of the new products. I was thrilled to see my favourite Baked Alaska Soap and Rose Jam Shower Gel had returned for yet another Christmas, so I made sure they went straight in my basket. Also how INSANELY cool is it that Lush have created their very own Igloo out of soap!?! So, not only did they bring back Rose Jam, they now sell that and Snow Fairy in (wait for it..) 1KG BOTTLES! I think this will make a lot of people very happy, as I know the two are very firm favourites at Christmas time! Overall, I had the best time ever at my first Lush event. The staff really gave it their all to engage everyone and teach us so much we didn't know about new and existing products! When we were leaving, we also got given some extremely generous goodie bags - so I will be doing a separate post on what I got! Thank you so much Lush Crawley - you're the best! I can't wait for the next event! I am so jealous! This looks absolutely amazing. We don't have a Lush where I love but next time I go away I am going to pick something up! Looks like you had so much fun! Can't wait to see what you purchased too, I just love Lush products, especially at Christmas :) Hopefully see you at the next Brighton one? Omg that's so amazing to be invited to a Lush store event! I love Lush!